On a recent LRT trip, on my car, there was a person in a wheelchair, a bicyclist with bicycle, a stroller, and travelers carrying wheeled suitcases. How much of this was made possible by “Universal Design” and the Americans with Disabilities Act? The problems that transportation disadvantaged individuals face are similar to, but more severe than the problems that the rest of the population sees on a day-to-day basis. Take, for instance, the simple question of which bus goes from the bus stop nearest my home to downtown. When going to the bus stop, is information provided other than the simple sign saying “Bus Stop”? Many stops don’t even identify routes, much less schedules. Without a guide (either person or documentation), using the system entails taking great risks, among them the risk of winding up across town from your desired destination and being hours late. The relatively simple, but seemingly revolutionary idea of providing information with the service may help. For instance, operators should make the signage clear so the bus stop can be found, make clear the route number, route end points, and the direction toward which the user needs to travel at the bus stop; make clear when the bus is coming, especially when service is infrequent; and clearly convey to the user, when he or she should get off the bus (which may require more than drivers announcing the bus stops as the bus travels the route). While this may be critical for those who are unfamiliar with the location (tourists) or the language (immigrants), it is also important for those who are cognitively challenged, and would probably provide a much better travel experience for those who lack special difficulties. Some transit systems do this, especially in downtown areas. Others would rather spend money on new rail construction (seeking new, wealthier customers) than make the existing bus system (serving existing, poorer customers) work well. To provide another example, when the Americans with Disabilities Act was passed, a major concern was retrofitting buses with elevators to accommodate wheelchairs. Buses traditionally had steps leading from the ground to the level where passengers sit. A more universal design would lower the floor of the bus (and gradually raise the level of the ground at the bus stop) so that wheelchairs could roll onto the vehicle, the way that occurs on many subway systems. Such a system would benefit many others with poor knees who can walk but find steps difficult. The lowering of the floor of buses is becoming more common, the raising of bus stops less so. Simple and Intuitive Use: Use of the design is easy to un- derstand, regardless of the user’s experience, knowledge, language skills, or current concentration level. Perceptible Information: The design communicates neces- sary information effectively to the user regardless of ambient conditions or the user’s sensory abilities. Size and Space for Approach and use: Appropriate size and space is provided for approach, reach, manipulation, and use regardless of user’s body size, posture, and mobility. I have recently spent some time milling about in the Minneapolis Mill District and part of the North Loop neighborhoods. These are hugely changed (and improved) over the past 15 years.The North Loop took off first, with conversion of old warehouses, and then a lot of infill development. The “northeast” part of the neighborhood (1st St from 2nd Avenue N to 8th Avenue N) might be called “complete” in the sense that there are almost no vacant parcels left to develop. There are a few (1st and 4th, 1st and 8th), but many fewer than there used to be, and many of those have developments slated to be built. I put the word “complete” in quotes to indicate that nothing is really ever complete, existing buildings can be remodeled or replaced, so the city remains dynamic. 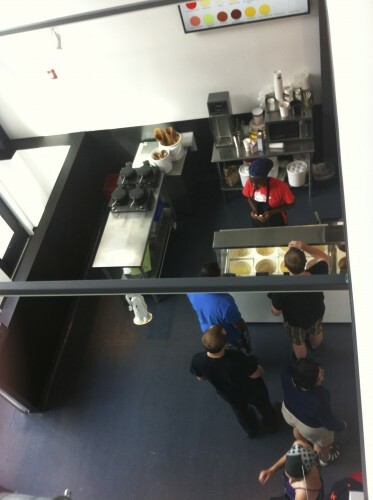 But the first step, filling in the vacancies is largely done. The “southwest” section has many more developable sites.The Mill District came more recently, being constructed on former rail yards and surface parking lots near the River. While there were a few Mill buildings that got renovated (most notably into the Mill City Museum), it comprises much more new construction. The Mill District possesses the Guthrie, (the maybe temporary) Gold Medal Park, one end of the Stone Arch Bridge, and just recently Izzy’s Ice Cream, and is near to the Metrodome and Downtown East. 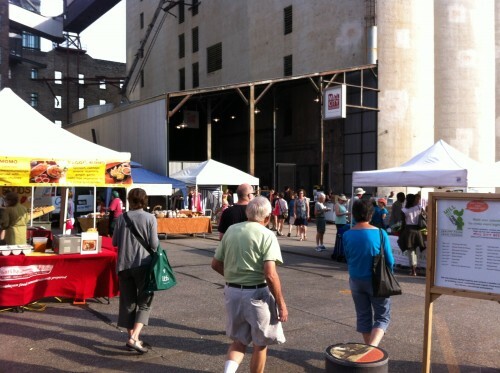 The Mill District, creates temporary street life with the Mill City Farmers Market. First Street N in the North Loop seems to do much better with inviting street-front shops than Second Street S in the Mill District. The Mill District has a greater number of institutional uses (theater, museum) and more parking ramps. Second Street S. is wider, with bike lanes in each direction in addition to one parking lane and one moving lane, with a wider parking lane. I haven’t measured them, but I am guessing at least 10′ wider. 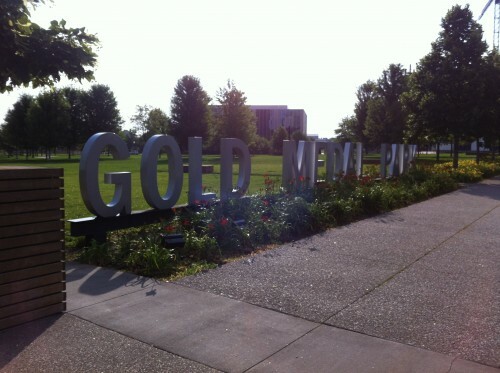 Gold Medal Park, while an amenity, reduces the urban feel. The park feels more like a park one might find in suburban Maple Grove rather than a tighter urban park. In part this has to do with younger trees. If this ultimately gets developed (or partially developed), it would change the feel. The light and shadows are different. The buildings on the south side of 2nd Street S and not as high as those on 1st Street N, and thus cast larger shadows. Clearly this changes with time of day and month of year, but it creates a different feel for the pedestrian. Both neighborhoods are in a very real sense new, even if they possess some old buildings, so have time to adapt. Additional infill development will change how both areas operate. But the vitality of the Mill District requires events (shows, markets), while that in the North Loop seems more continuous due to the more permanent retail establishments. A key lesson is that it is often easier to grow an urban neighborhood from an existing lattice of structures than try to plop one down on a brownfield site. (This is not inherently a criticism of the Mill District, much of which was surface parking, and before that rail yards and had fewer structures to salvage). Thus we should try not to destroy viable structures or neighborhoods until we have considered renovating them and we have exhausted vacant parcels. Of course, one might say, that is the obvious lesson from urban renewal some 50 years ago. But this still happens: The old Marshall HS in Dinkytown, e.g., or the Colonial Building at Emerald and University on the Central Corridor that has been a vacant parcel for about 7 years now. While construction is well-underway on the Marshall HS site, the Emerald and University site (variously 2700 The Avenue or City Limits Apartments) sits fallow. Things might happen between demolition and construction, so that construction which was planned falls through mid-project.But I think no one is careful enough with existing buildings (not necessarily historically significant ones) in neighborhoods with vacant lots. Fill it with temporary uses at low rent, (e.g Streets.MN wants a clubhouse, or more seriously following the model of the Starling Project) that is far better than using it to store cars or raise weeds.